With wet snow clinging to the grass, it bends and flattens to begin the mulching and seeding process. Snow can be a heavy blanket. While this snow will not last, the next snowfalls will continue the flattening process so that by springtime, there will be little trace of the previous year’s plants. 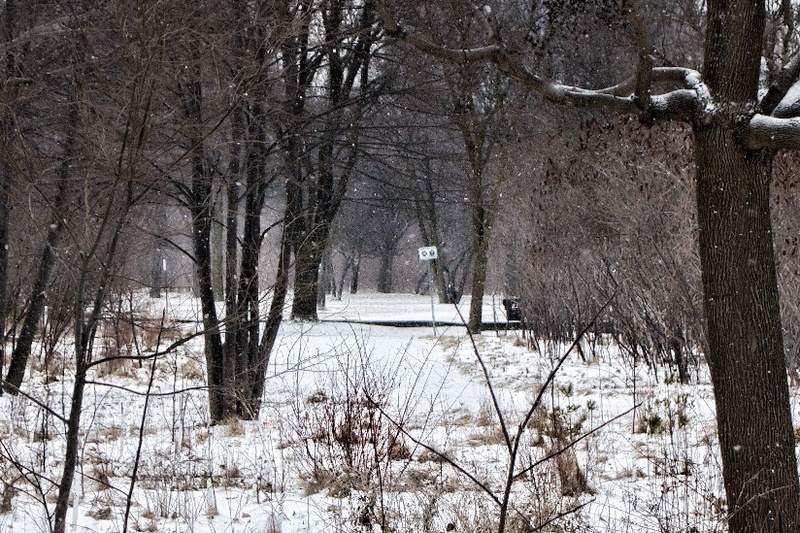 This entry was posted in Photography, Raymore Park, Snow, Trees and tagged Raymore Park, snow, wet snow on 2013/11/29 by Roy Murray. Day lilies are shocked I tell you. 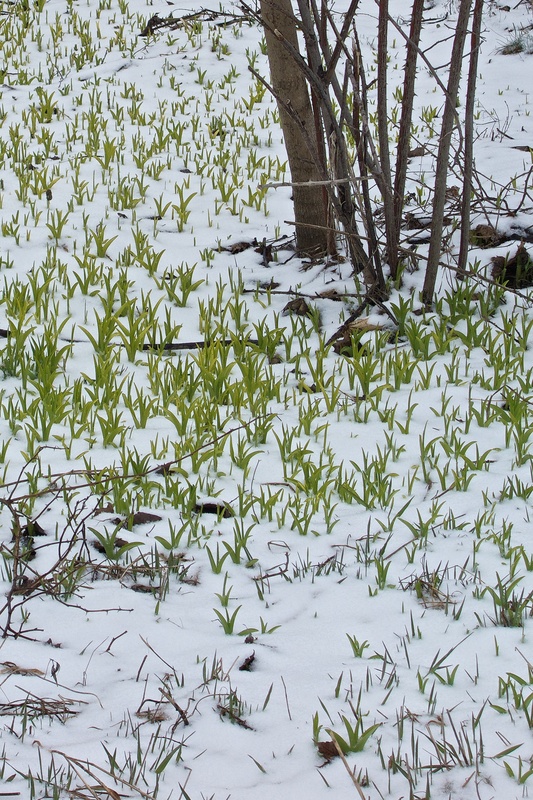 The park was cold and snowy today and a fresh covering made it look like January except for bright green new growth sticking out through the snow. These day lilies are probably remnants of gardens that belonged to homes destroyed during Hurricane Hazel. 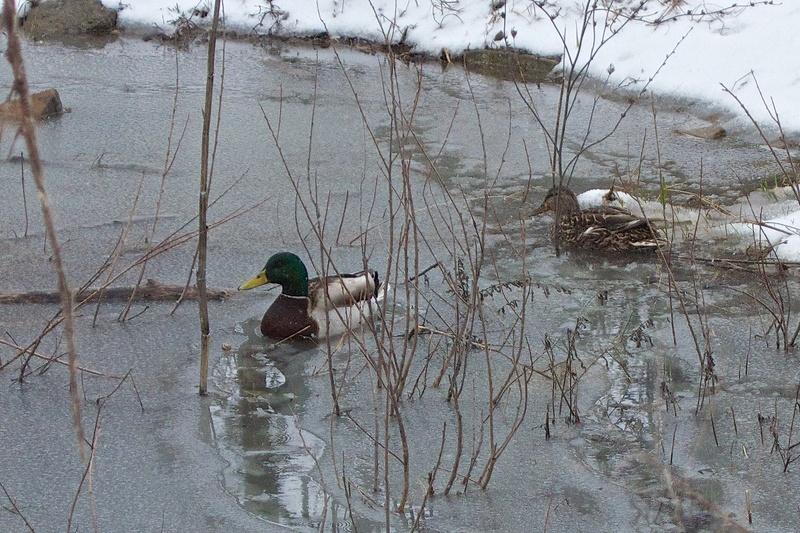 A pair of Mallards swimming around a temporary pond were taking refuge from high water in the river. I was careful to stay well clear so that they weren’t disturbed. Ice is forming in April!! 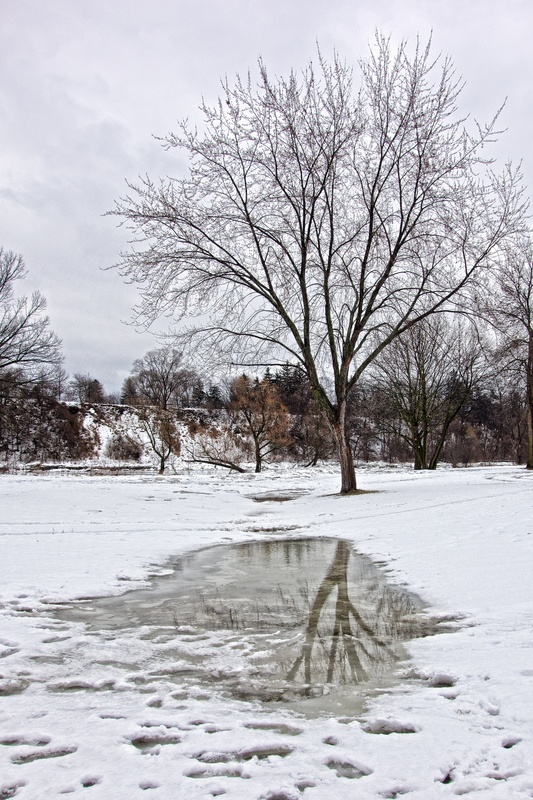 This entry was posted in Humber River, Ice, Photography, Snow, Wildlife and tagged day lilies, Humber River, mallards, photography, Raymore Park, snow on 2013/04/11 by Roy Murray. More snow today on the edge of a major winter storm that luckily just missed us. Another day of winter is disappointing to humans but wildlife is really feeling the pinch. There were redwing blackbirds in the park a few days ago but there’s no trace of them now. Nothing has budged from its winter state so spring is still some time away. Because of thick cloud cover, the more powerful March sunshine is neutralized. On days like these, I usually have the park to myself. 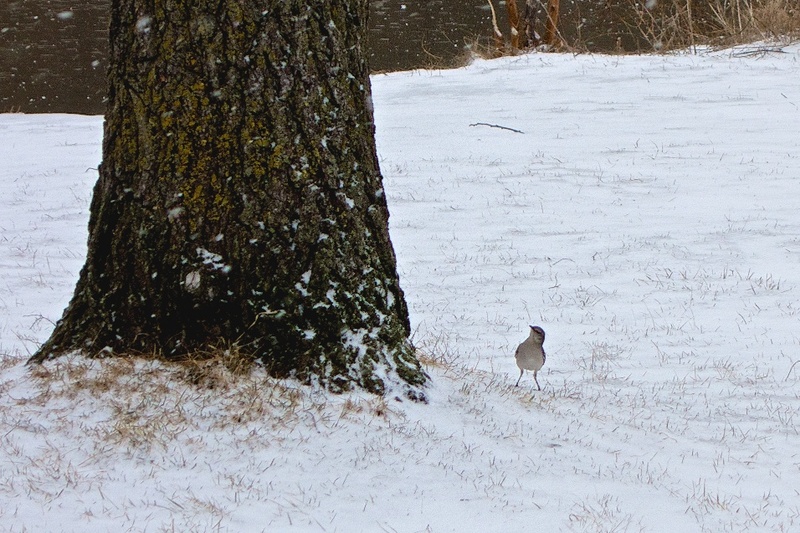 A Grey Jay looks for food. 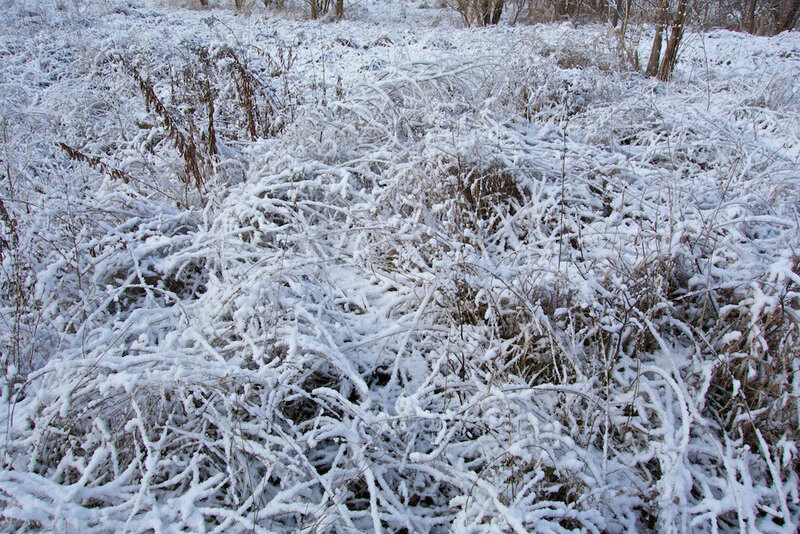 Fresh snow covers the ground and the temperature barely cracked 0°C today. Looking north to the path by the weir. At the weir the water had an interesting oily look that the camera was able to capture quite nicely. Snow flakes and an oily texture you can almost touch. This entry was posted in Park view, Photography, Snow, Wildlife and tagged Raymore Park on 2013/03/19 by Roy Murray. Lots of fancy equipment here! 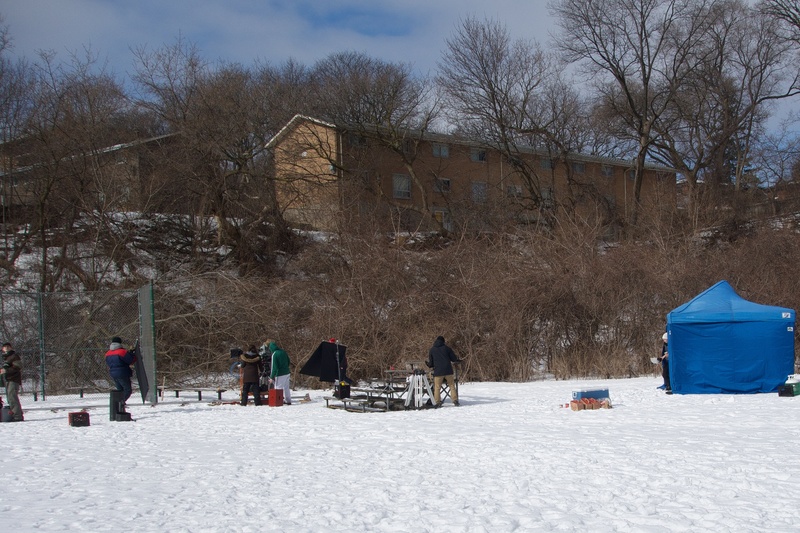 Students from York University are occupying one of the baseball diamonds today for a movie shoot. They seem a little cavalier with their garbage. Hopefully they will perform a site clean-up. 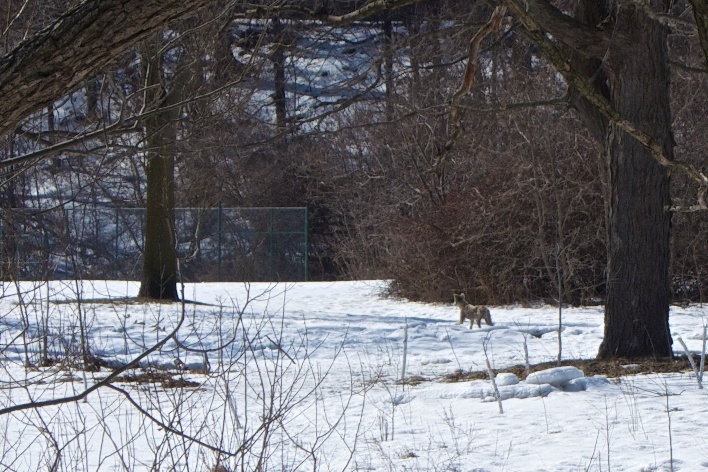 A coyote calmly making its way through the park today. I was quite a distance away and had to squeeze as much magnification as possible from this shot. Lastly, what a difference a day makes. 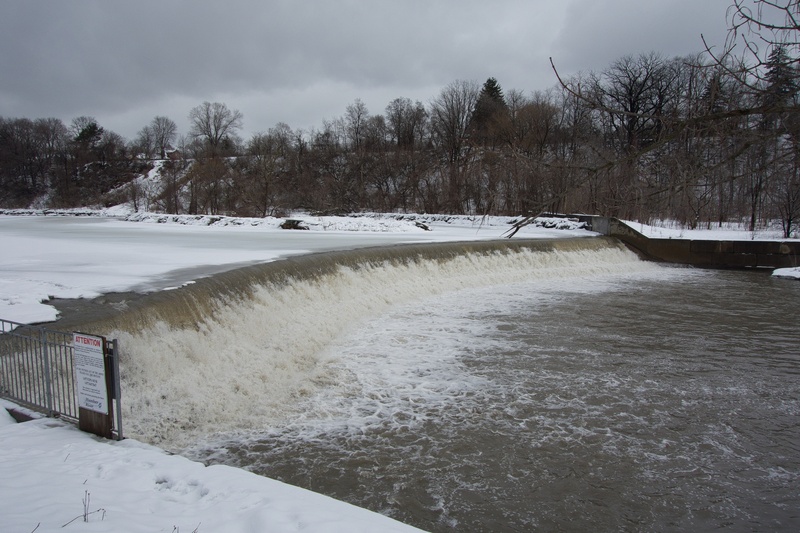 Suddenly the river has lost much of its ice. The ducks are happy. 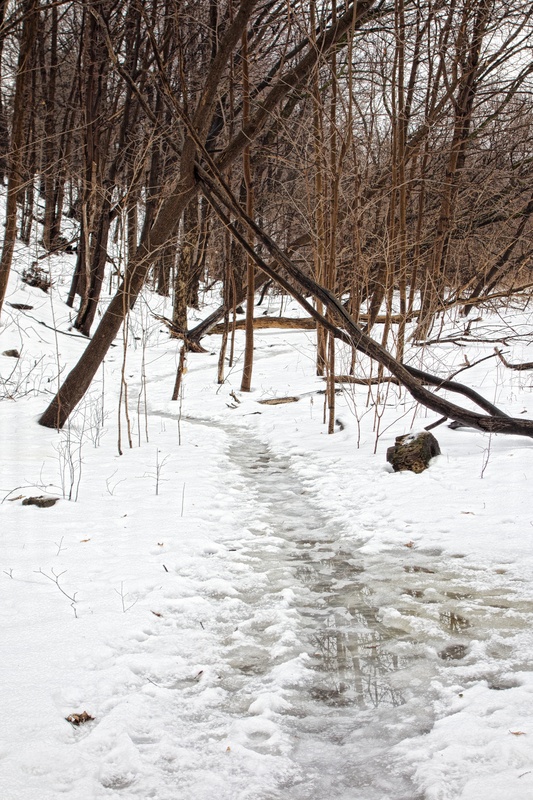 This entry was posted in Humber River, Ice, Photography, Snow and tagged coyote, York University on 2013/03/01 by Roy Murray. 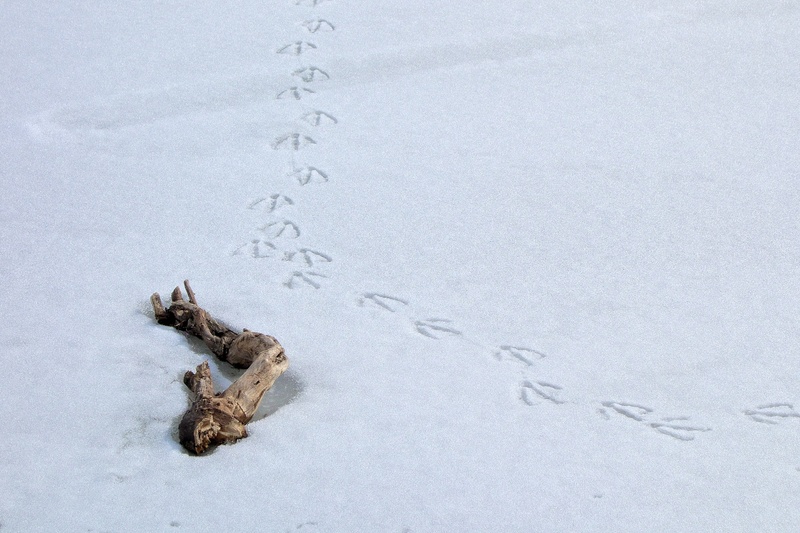 Snow is a wonderful medium for creating impressions through the tracks of animals or humans or the melting that happens around objects as the sun shines on them. Goose tracks beside part of a tree branch. 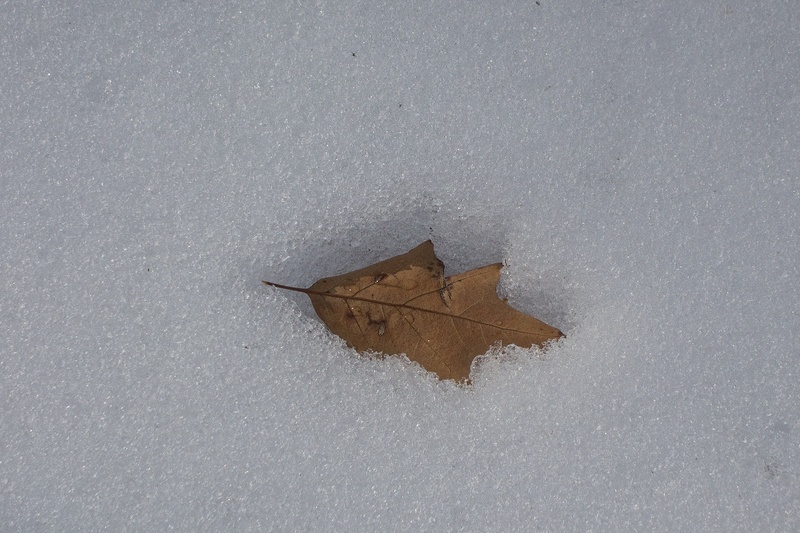 A recently fallen oak leaf ‘burns’ its way into the snow. At this time of year the sun is much stronger and anything that falls onto the snow reflects less of the sun’s infra-red radiation and so will melt the snow underneath it while the surrounding snow stays frozen. 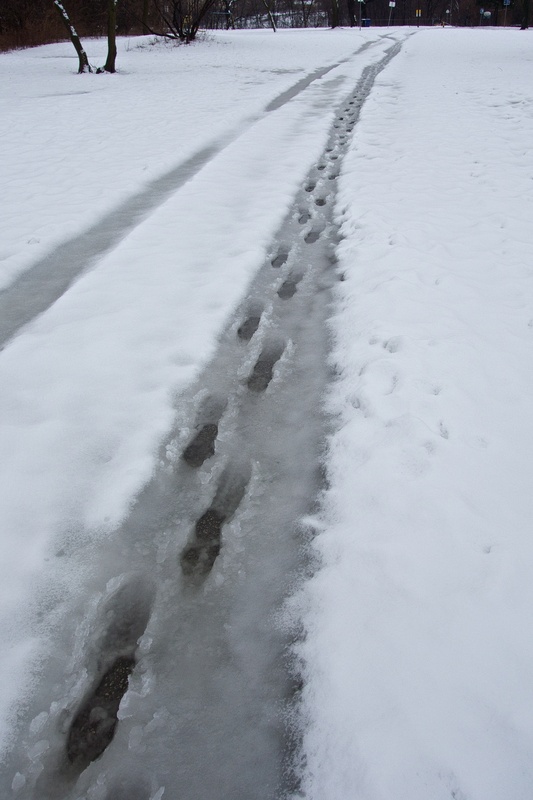 A human has walked in slushy tire tracks. 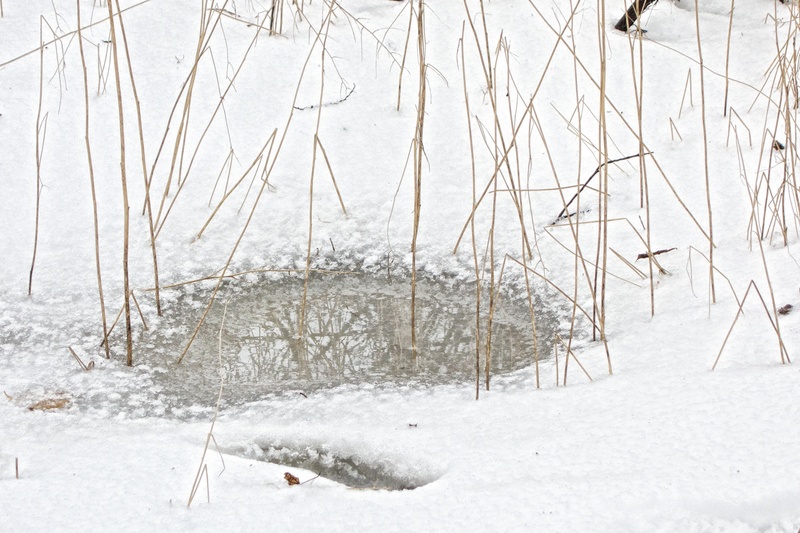 This entry was posted in Ice, Photography, Snow and tagged imprints, photography on 2013/02/27 by Roy Murray. A steely-grey cloud deck, fast moving clouds being pushed along by a raw east wind can only mean one thing; snow is coming. This time we’re getting off lightly with just a couple of centimetres while temperatures will rise above the zero mark for the next few days. 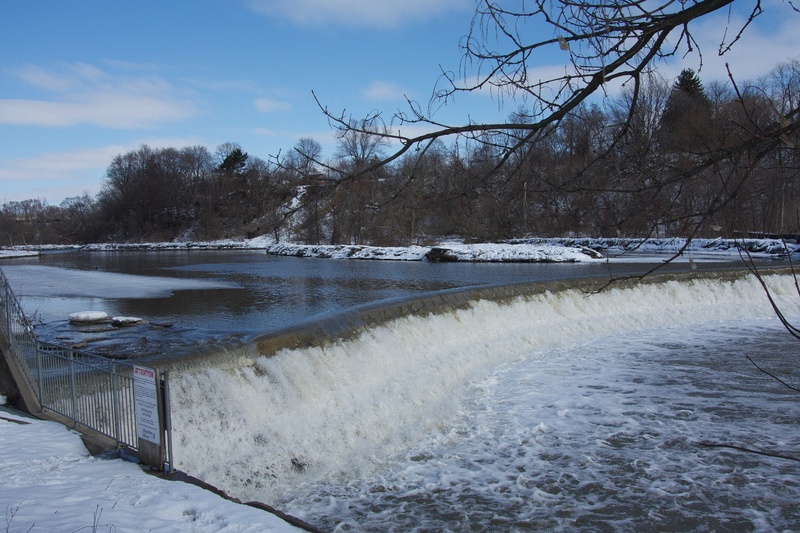 Above the weir, a large natural ice surface has magically appeared that (with some smoothing from a handy Zamboni or some strategic flooding) could be a fantastic outdoor rink. These two photographs were taken from the same spot. 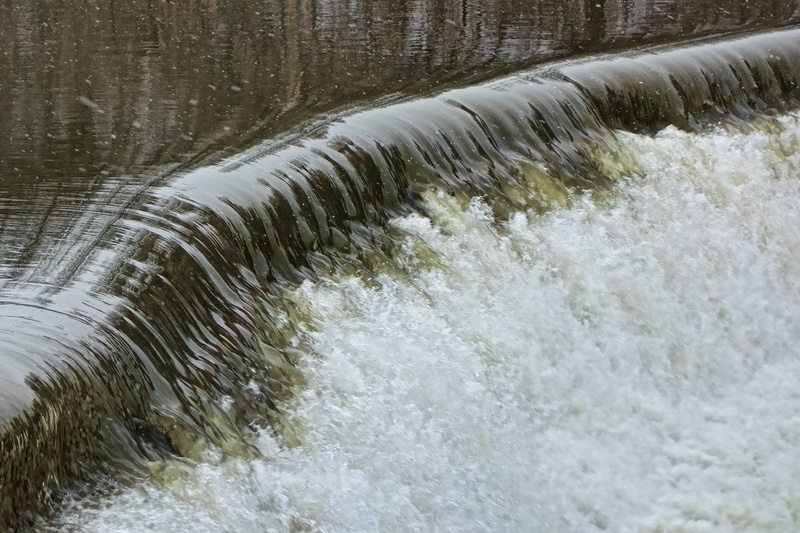 Looking downriver over the weir. Since the icy conditions have taken over and glazed the pathways, very few people are using the park as the entrance (closed to traffic for the winter) from Raymore Drive is on a steep slope. Only the die-hards with footwear designed for ice are braving these treacherous conditions. Even the extreme weather cyclists have admitted defeat. Not a square centimetre of spandex in sight! I must admit it’s nice to have the place to yourself and no doubt wildlife prefers it too. 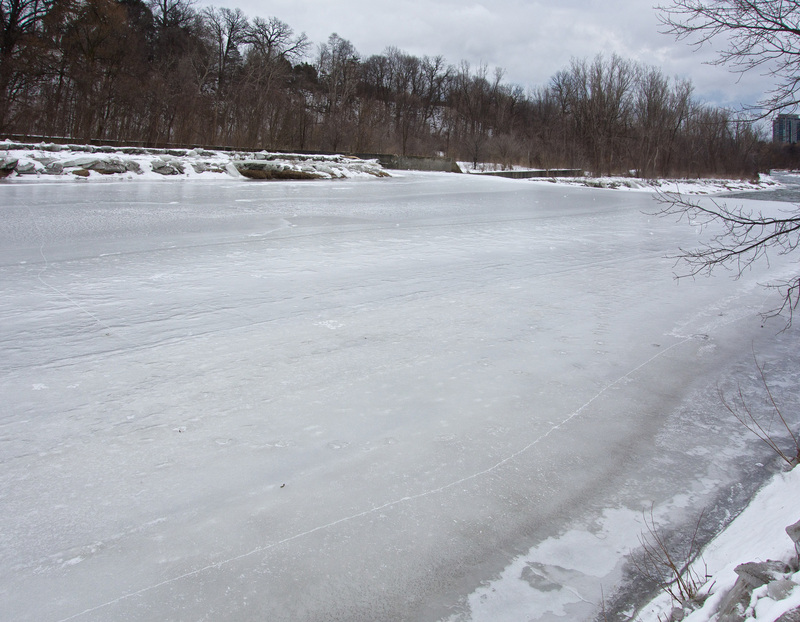 This entry was posted in Humber River, Ice, Snow and tagged ice, Raymore Drive, skating on 2013/02/22 by Roy Murray. Yesterday was a sloppy slushy rainy day with rain and mild temperatures. 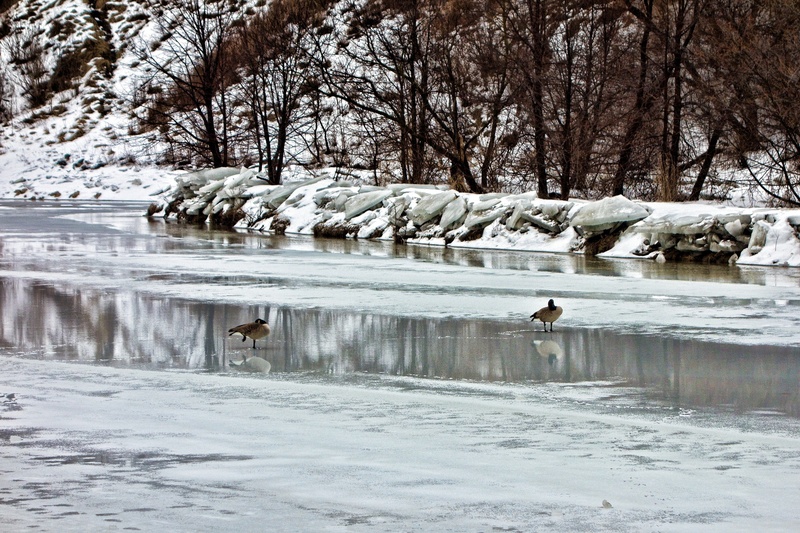 A pair of geese standing on wet ice in the river prompted a quest for reflections. The closer one was quite relaxed and was in its sleeping position. A pair of Canada Geese spend some quiet time on the river. 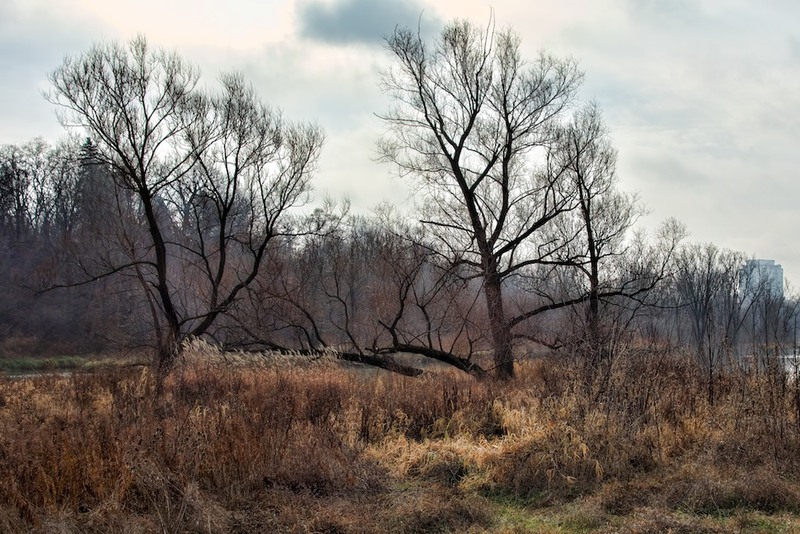 Large pools of earth-tinted water form in depressions allowing another view of the trees. 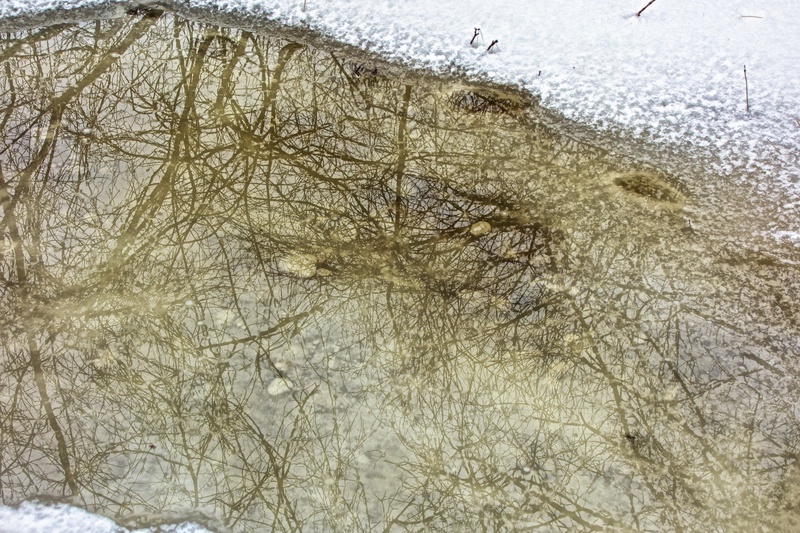 A maple is mirrored in slushy water. 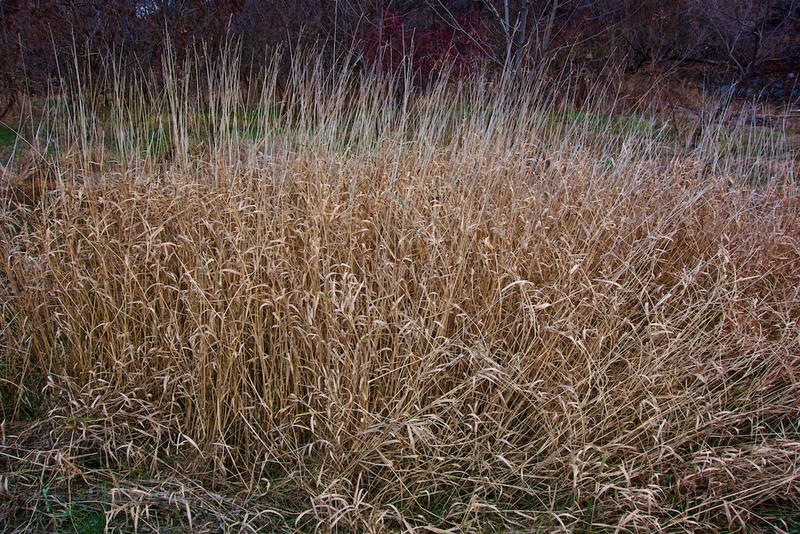 Last year’s grasses stand around a small depression. Wet branches are darker and more colourful in the rain. 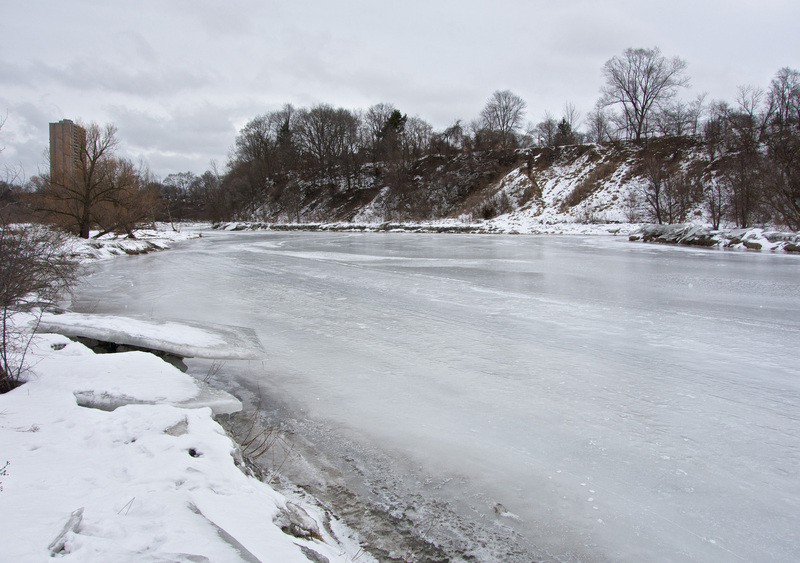 This entry was posted in Humber River, Ice, Park view, Photography, Snow, Wildlife and tagged Humber River, reflections on 2013/02/20 by Roy Murray.